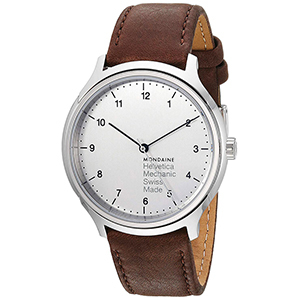 The Mondaine Helvetica No1 Regular Mechanical Hand winding Stainless Steel Mens Watch Model # MH1.R3610.LG is designed as a tribute to the 1950’s watches. This watch features a Swiss mechanical handwinder movement and features a polished stainless steel case for added protection, An anti-reflective sapphire crystal is integrated over the case for better visibility, silver dial with black Arabic Numeral and index hour markers, Black & silver hand indicators, Push & pull crown with Mondaine logo, Brown genuine leather strap with pin buckle - engraved Mondaine. The watch is water-resistant up to 30 meters / 100 feet. It can be paired with classic apparel and worn to formal events like weddings and elaborate ceremonies. Like all of our watches, this Mondaine Helvetica No1 Regular Stainless Steel Mens Smartwatch is Brand New and comes in its original packaging! Mondaine Watch Ltd. is a Swiss company hugely acclaimed for its distinctive designs, modernistic technology, and unparalleled performance. A line of Mondaine watches, called the Official Swiss Railways Watch/SBB, is inspired by classical Swiss railway clocks. The watch was first designed in 1944 by Hans Hilfiker, while the company got its designing license in 1986. Originally, the company launched watches with only 58 seconds dial unlike the common 60 seconds. This was done in order to stop the second’s hand for 2 seconds on the numeral 12, giving an illusion that time has stopped. Mondaine creates watches featuring easy-to-read face. Their signature red second hand is uniquely recognized all around the world. They embed ingenuity and simplicity to exemplify excellent 20th century design.